There’s no better way to spend your weekend than at Smorgasburg–a food flea market located in Brooklyn. It happens every weekend at two locations: Saturdays at East River State Park on the Williamsburg waterfront, and Sundays at Brooklyn Bridge Park’s Pier 5. Both locations are open from 11 am to 6 pm until November 23rd. Here are some of the best bites–both hyped and hidden–to try on your next visit. 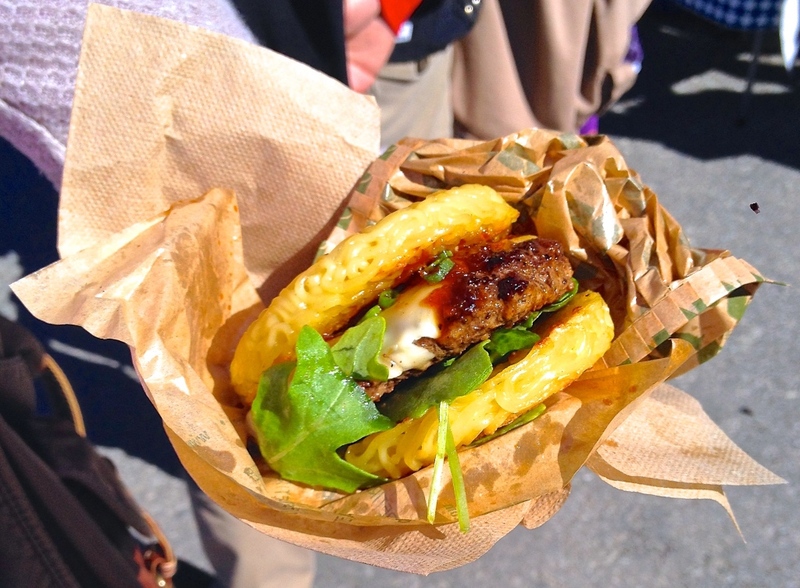 Like the Cronut, the Ramen Burger has been getting plenty of hype throughout New York. I’m not even a ramen fan (am I really a college student? ), but I needed to try this just so I could say so. I expected an incredibly long line, but the wait was less than 15 minutes. I ordered mine with cheese for $1 extra, cause hey, why not? The burger is made with a thick beef patty and topped with cheese, a sweet marmalade sauce, finely diced chives and fresh arugula, all sandwiched between ramen-noodle buns. Despite being juicy and slightly sweet from the marmalade, the burger is nothing mind blowing, as it lacks a strong ramen flavor. Though it isn’t anything out of this world, the ramen burger is definitely worth trying for bragging rights. When it comes to Chinese sesame pancakes, Outer Borough does not disappoint. Their pancakes are essentially fried dough filled with a choice of protein, veggies and their special Borough Sauce. 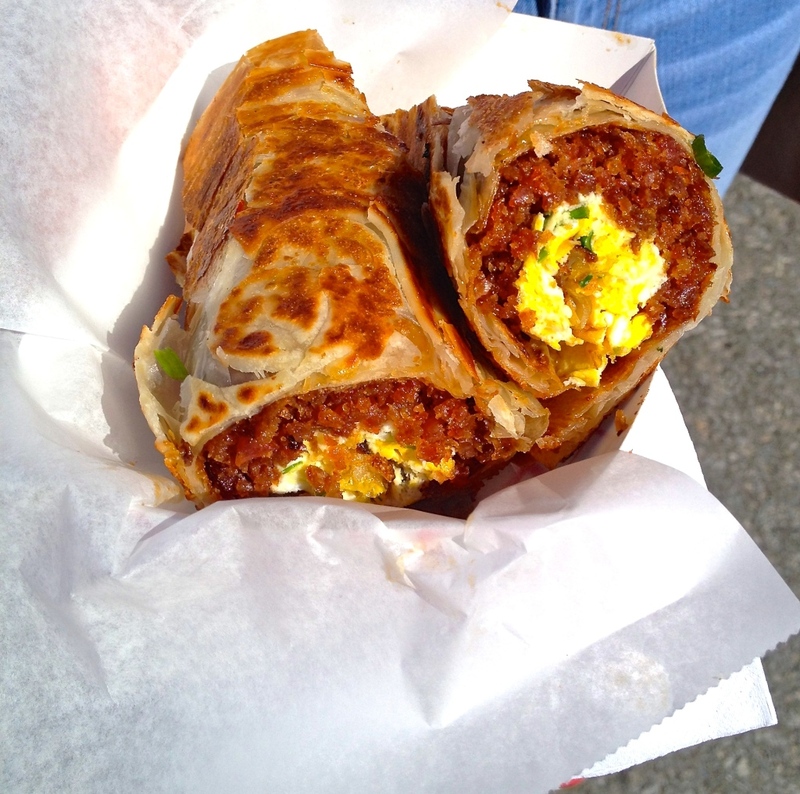 The egg and sausage pancake comes wrapped like a skinny burrito with sausage that looks like bacon bits. Don’t let the simple appearance fool you; the flavors will make you feel like you’re at a true Hong Kong food cart. The sweet Chinese sausage is perfectly caramelized and scallions give it a nice fresh bite. The pancake is not overly greasy and comes fried to perfection. Pair it with a little Sriracha sauce on the side, and you’ve got yourself exotic Asian fusion flavors wrapped in a roll. For those of you who don’t know what mofongo is, it’s a Puerto Rican dish made with mashed plantains, garlic, pork cracklings and some sort of broth. Mofon’go is the real deal; they even smash the freshly fried plantains in a mortar and pestle! 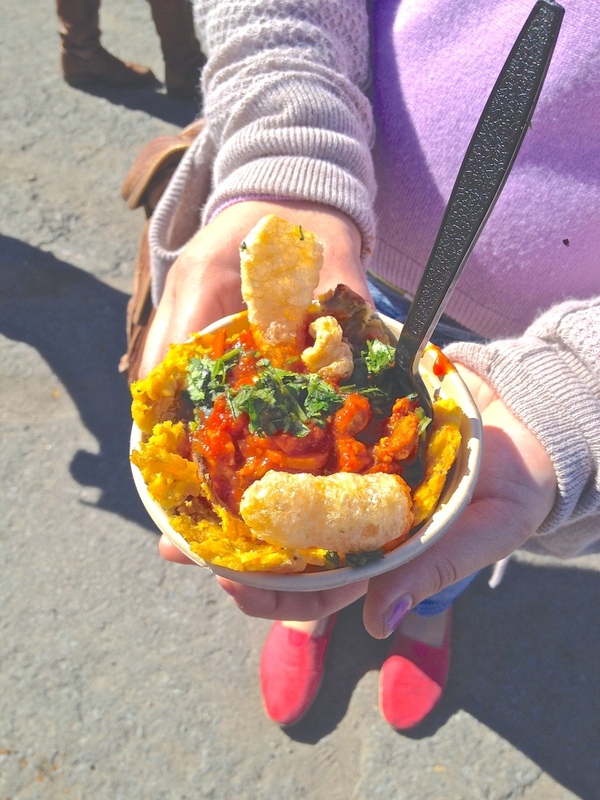 The Creole chicken mofongo has sofrito base with tomato sauce, bell peppers, onions, topped with cilantro and crispy pork rinds, all in a cute biodegradable cup. Everything is very flavorful and the starchy plantain is the perfect vehicle for soaking up all the broth. I’d definitely recommend this for those who want to try some authentic Puerto Rican cuisine that’s different from the typical taco and noodle vendors. 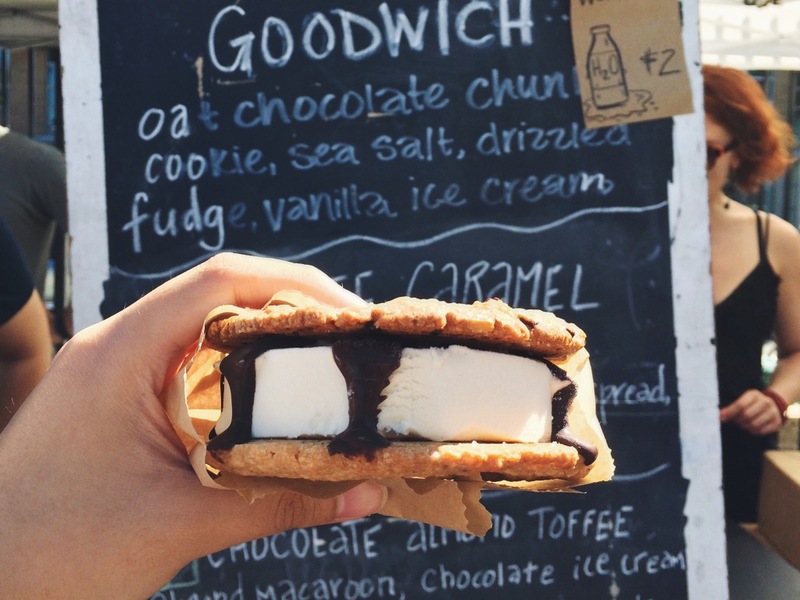 What better way is there to end a Smorgasburg adventure than with a big ol’ ice cream sandwich? Do not be deterred by the extremely long line at Goodbatch—the popular ice cream sandwich vendor. Luckily, the line moves fairly quickly. Opt for the Goodwich—an oatmeal chocolate chunk cookie filled with vanilla ice cream, drizzled with fudge and topped with sprinkles of sea salt. The cookie is crisp but chewy with the perfect sweet and salty flavor combo. The ice cream us rich and velvety with a subtle vanilla flavor that lets the cookie be the star of the show. For $6, I’d say you get your money’s worth; the sandwich isn’t only blow-me-out-of-this-world good, but it’s also a good head’s size, making it a delectable and filling dessert. Get one, and it’s safe to say you’ll end your day at Smorgasburg on a sweet note.